Securely affix your smartphone to tripods, monopods, and more with the RetiCAM Smartphone Tripod Mount with XL Conversion Kit. This mount holds devices 2.1 to 3.1" wide, or up to 3.6" wide with the included XL Conversion Kit. A 1/4"-20 standard tripod threaded hole can be found on its bottom. CNC machined from solid aluminum, each bracket features a groove that leaves room for your device's edge buttons. The brackets are sandblasted, anodized, and laser-engraved. An anti-rust steel bolt with knurled thumb knob holds the brackets together, while the slider rods are CNC machined from DuPont Delrin thermoplastic. Rubber pads with 3M adhesive backing hold your device in place. A hard-shell EVA case with scratch-resistant interior and internal mesh pocket holds the mount and more. Box Dimensions (LxWxH) 4.8 x 3.4 x 1.65"
Smartphone Tripod Mount with XL Conversion Kit is rated 4.8 out of 5 by 23. Rated 5 out of 5 by Matthew from Pro phone tripod mount... none better on the market Hi all, I think my title says it all. This is BY FAR the most solid phone holder I have ever seen. I will be able to mount my phone to my Ronin MX without any concerns. I take it back, maybe ONE small concern, and this is just a note to be careful. This clamp is tightened by the user (rather than a spring). The clamp is so strong, it would not be impossible to damage your phone. Not that I have tested it, and not that I have technical data to back this claim up, but i have a lot of engineering and practical construction experience and this feels like you could absolutely screw the knob too far and crush your phone if you wanted to. That said, I don't think there is any problem if you use common sense. I'll be buying another one of these for my second gimbal. Rated 5 out of 5 by Mike from Solid build phone holder I got this just to have with me when I head to the beach or a restaurant and do simple time lapse. I have also attached it to a bicycle and done a simple ride around a beach town. Phones get larger and larger these days, so I wanted a secure way to hold it. If you are going to do an extreme sport, I suggest using an action camera. But the build is sturdy, comes with spare parts, and tightens well around my phone to hold it. Rated 5 out of 5 by Benson H from An Excellent Tripod Mount After reviewing all of the various tripod mounts available from B&H for my smartphone, the RetiCam seemed to be the best choice. I was not disappointed. Solid, simple to attach/detach, secure, no damage to the phone, very well made and reasonably priced, my experience mirrors those of other reviewers. 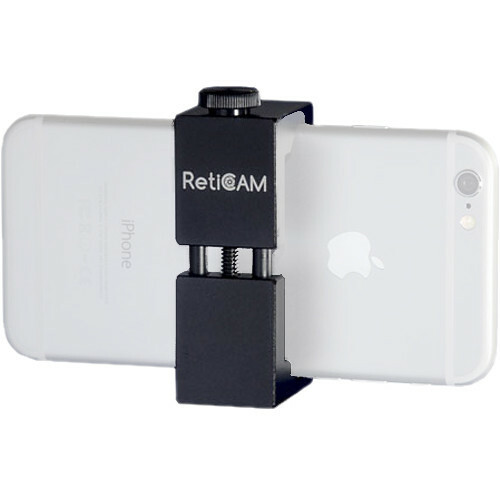 The RetiCAM can even be left on the phone to provide a better grip when its not fastened to a tripod. Rated 5 out of 5 by David K. from Virtually infallible & indestructible! Brilliant design, fully secure and reliable. Since I use iPhone 7 plus, which is relatively large and heavy, I would not trust it to another mount made of plastic with a spring mount. This is especially true if you happen to place your phone on a monopod that you might use as a boom pole! This is the only tripod mount for me. Worth the price, good security. Rated 5 out of 5 by Hugh from Outstanding poduct This is the second one of these tripod mounts I've bought. Gave the first one to an adult daughter who quickly lost it. I use mine to clamp my smart phone to a tripod to Skype. You literally will experience nary a shred of buyer's remorse by purchasing this product. Oh yes--buying from B&H was absolutely problem free. Rated 5 out of 5 by Allan from Durable & Indispensable Used to securely attach a 3" wide cellphone to tripod for videography. Excellent design and superb construction. The Carrying Case is a brilliant inclusion. I suppose a 3/8"-16 threaded hole could have been included but this posed absolutely no issue for my application. Rated 5 out of 5 by Don from Clean and solid Very nice clean simple design that holds an iPhone XS Max and case without even using the XL kit. The set screw holds the phone solidly in place with no chance of slipping even though it attaches or removes in just seconds. Good price too. Rated 5 out of 5 by Anonymous from Pro quality at a low price Fits my iPhone 7 with otterbox defender perfectly! Solid hardware that is screw mount adjustable and isn't dependent on springs or straps to secure it in place. Forget the iPhone cages, just get this for 1/4 the price and call it a day. Is that a 1/4 thread on the bottom?